Shake and roll to hear this lovable owl's soft chimes sing. 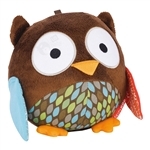 Tuggable wings and feet make this the perfect forest friend for little ones! 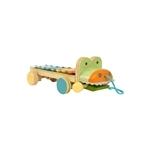 Eight unique notes line the croc's back, allowing little ones to make music with this activity-filled friend. Hear his mouth click and clack as this rockin' reptile is pulled along the floor!